Truly Natural Vitamin C from HealthForce is formulated with Acerola Cherry Powder, which naturally contains valuable quanities of Vitamin C. Synthetic or isolated forms of Vitamin C are not completely natural; therefore, the body has to work extra hard to absorb the nutrients. In synthetic forms, much of the Vitamin C is not readily absorbed by the body, leaving it to be eliminated as a by-product. Truly Natural Vitamin C, however, is easily digestable, meaning your body absorbs the right amount of nutrients that it needs. 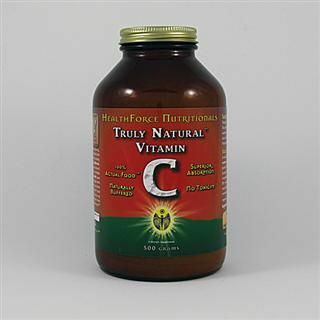 Truly Natural Vitamin C is 100% food with naturally occurring bioflavonoids that work to help the body absorb the Vitamin C while achieving a healthy balance. Vitamin C is valuable to the body's day to day functioning as it helps build up the immune system, making it possible to fight off disease. Other ingredients: Maltodextrin (complex carbohydrate from corn) as drying medium. I truly love this whole food source of Vitamin C. I use just a tsp every day during the winter months and I feel great. Since I started using this powder I have not had a cold for 2 winters!